Smart Charge Pencil Cup with USB Hub is a great addition to your office or home. Designed to fit any smartphone, e-reader, or tablet, the Smart Charge Pencil Cup keeps your device handy while keeping pens, pencils and other utensils close at hand. The angled pencil cup can also be used to hold a second phone. Four-port USB 2.0 hub charges your phone or connects to your computer allowing data transfer from flash drives, phones and other devices. Access channels under the base keep cables in place while the rear cord keeper stores extra cable out of sight. Wood construction, black matte finish and sleek styling make this handsome accessory perfect for every desk. 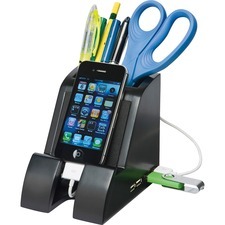 Pencil cup includes a four-port USB hub, nonslip rubber feet and a 6' mini USB cable.